1. 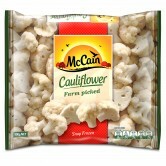 Place ½ of the thawed McCain Cauliflower into a food processor bowl and pulse until it resembles rice. Be careful not to over blend or it will become too mushy. Remove and repeat with remaining cauliflower. 2. Place cauliflower rice into a clean tea towel or cheesecloth and squeeze well to remove excess moisture. Meanwhile, heat a large non-stick pan over a high heat and add strained cauliflower rice to the pan. Use a spoon to break up any chunks and cook, stirring occasionally for 5-7 minutes or until golden. Remove from heat and allow to cool. 3. Place olive oil, apple cider vinegar, lemon juice, honey and garlic in a small bowl and mix well to combine. 4. Place cauliflower rice into a large mixing bowl, add dressing and remaining ingredients, and toss well to combine. Refrigerate until ready to serve. 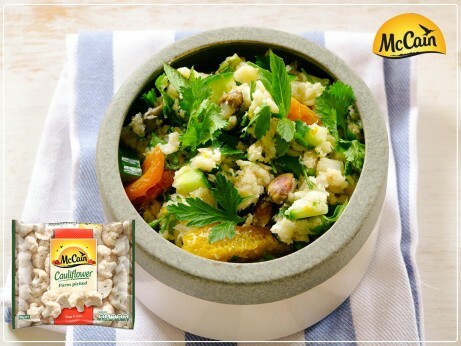 1 Place ½ of the thawed McCain Cauliflower into a food processor bowl and pulse until it resembles rice. Be careful not to over blend or it will become too mushy. Remove and repeat with remaining cauliflower. 2 Place cauliflower rice into a clean tea towel or cheesecloth and squeeze well to remove excess moisture. Meanwhile, heat a large non-stick pan over a high heat and add strained cauliflower rice to the pan. Use a spoon to break up any chunks and cook, stirring occasionally for 5-7 minutes or until golden. Remove from heat and allow to cool. 3 Place olive oil, apple cider vinegar, lemon juice, honey and garlic in a small bowl and mix well to combine. 4 Place cauliflower rice into a large mixing bowl, add dressing and remaining ingredients, and toss well to combine. Refrigerate until ready to serve.